Posted by aconsciousappetite in Food, I Love Pizza!, Oink Oink, What's Cooking? I’ve been back in Marbella for a few weeks now. I know, sneaky blogger. I did mention that I was only in China for one week…so, yes, I did milk that one week over a few weeks of posts. Heh, cheeky. When I returned home, I was, naturally, craving home cooking…especially pizza. That’s no surprise…but, I did come home to a real surprise – Ooo, I love surprises! Dear bf added a new “addition” to our Marbella kitchen…a little something that we’ve been talking about for a while now. This is such a Spanish staple that I will go into it further on a future “A Few of My Favorite Things” post. Well, you can imagine that this pretty much decided our next pizza. It was a no-brainer since I’ve been craving a Hawaiian Pizza. I start with a fresh pineapple. Sure, the canned stuff will do, but go the extra step for fresh, it’s worth it. …look at the result! Could this be more simple? All fresh, quality toppings is what makes this pizza and using Iberian ham takes it to another level. Mmm, it tasted so good. I hope everyone had a wonderful Thanksgiving and are enjoying the rest of your holiday weekend! Posted by aconsciousappetite in All Fowl, I Seafood, Oink Oink, Pastas and Such, Restaurants, Where's The Beef? I met up with my lovely mother in Shanghai for a one week visit. She flew from the San Francisco Bay Area and I flew in from Spain. A week is too short, I know, but we made the most of it! I begin the visit with a lesson on how to numb your mouth properly. Sounds fun, right? Let’s proceed. 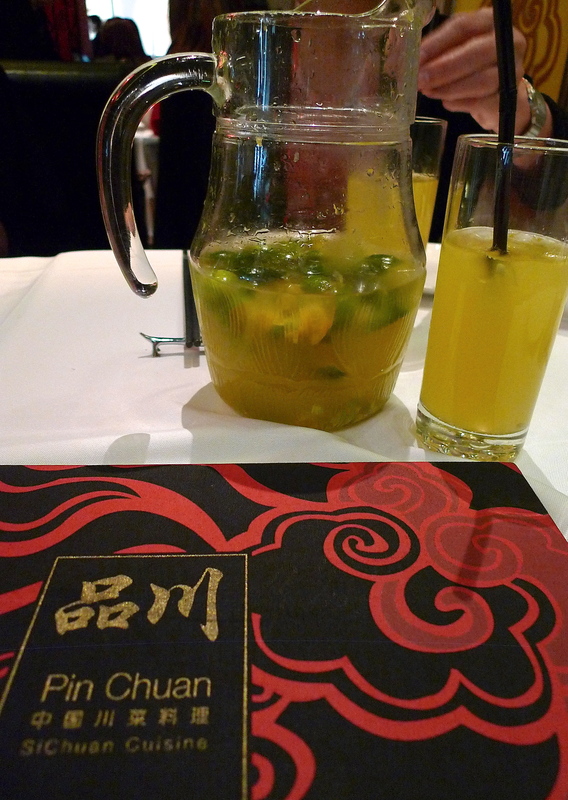 First, go to a Sichuan restaurant. Second, order the house Sichuan specialties. Third, order more spicy dishes to accompany the aforementioned specialties. 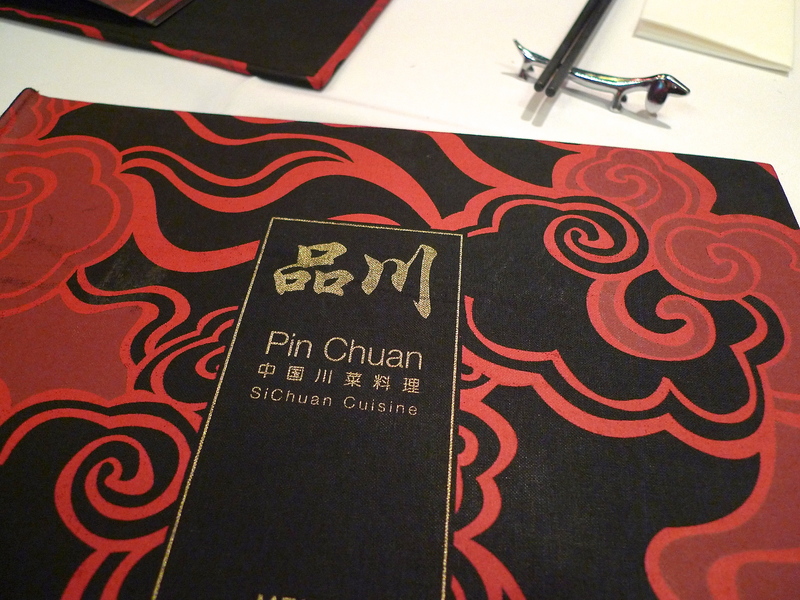 Our good friends who live in Shanghai took us to, Pin Chuan, a contemporary Sichuan restaurant located in Plaza 66. 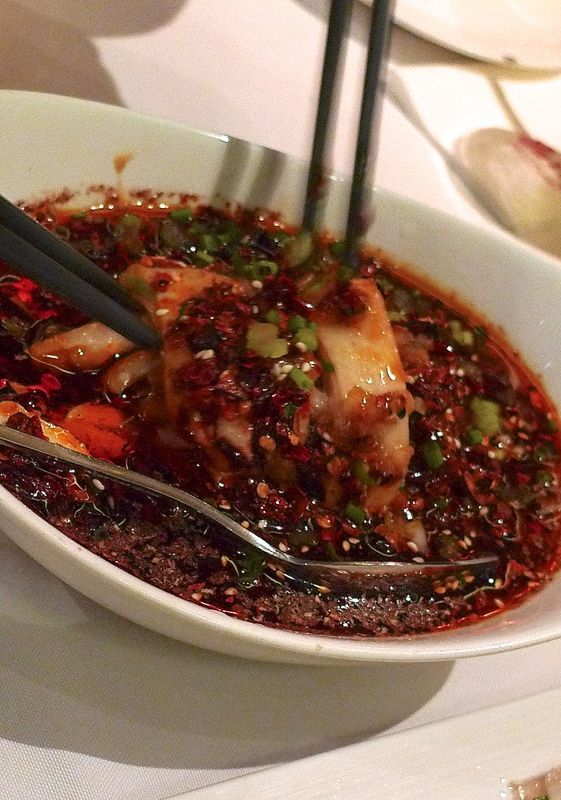 Sichuan cuisine (commonly referred as “Szechuan” in North America) is known for their bold and spicy flavors and use of Sichuan (HOT) peppers which do give your mouth a “numbing” kind of quality. 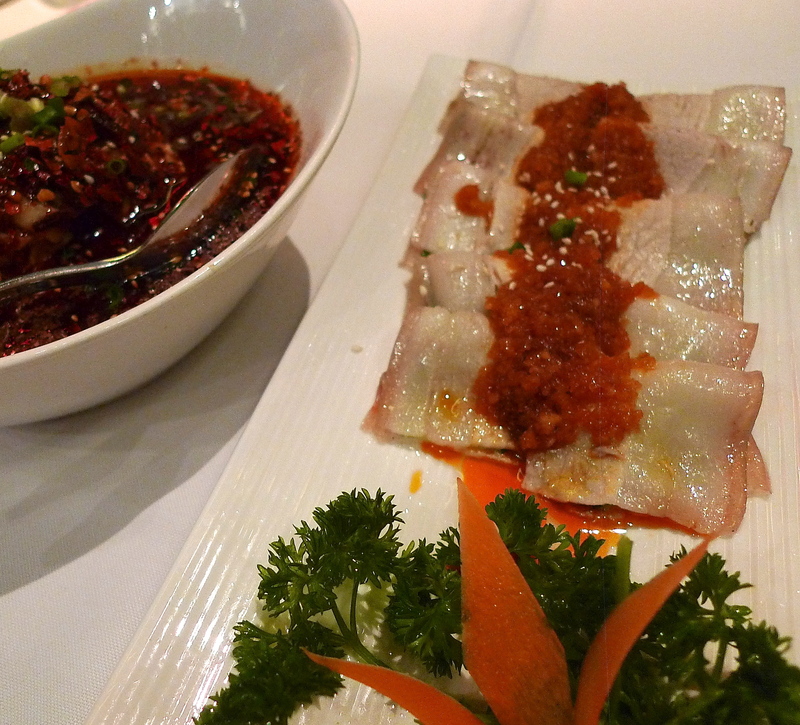 As you know, Chinese food is eaten family-style and we kick off with these slices of pork belly for the table. They’re delicate in texture, low on the spicy scale and a great way to ease into our lunch. But next comes the real deal. “Mouthwatering” is such an understatement when they named this starter. The dish is served cool. The chicken is juicy and swimming in this sublime chili oil. All I can say is my mouth was watering from the heat as well as from the great combination of peppers and sauce. I couldn’t stop eating it and probably had more than my fair share. Sorry. 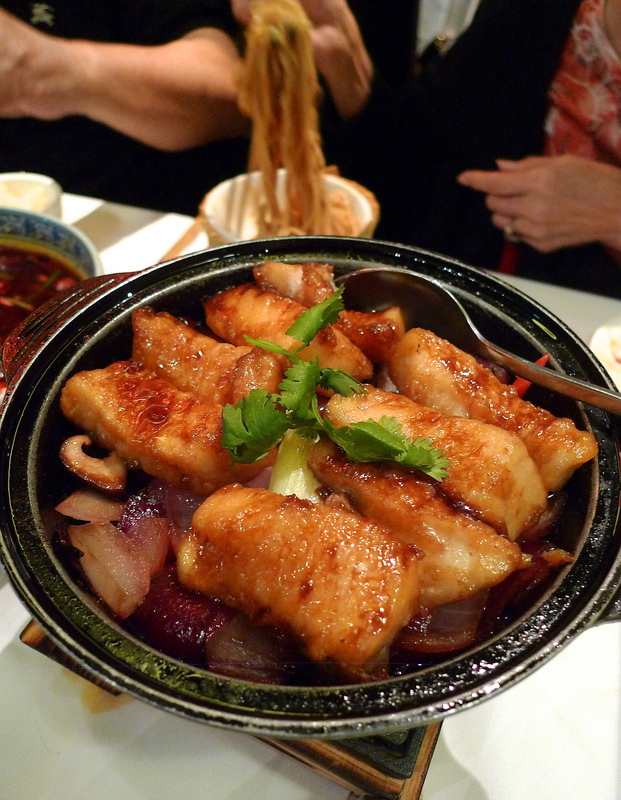 Aside from the well-known spicy fare, Sichuan cooking is balanced with dishes that give your palate a cooling rest. 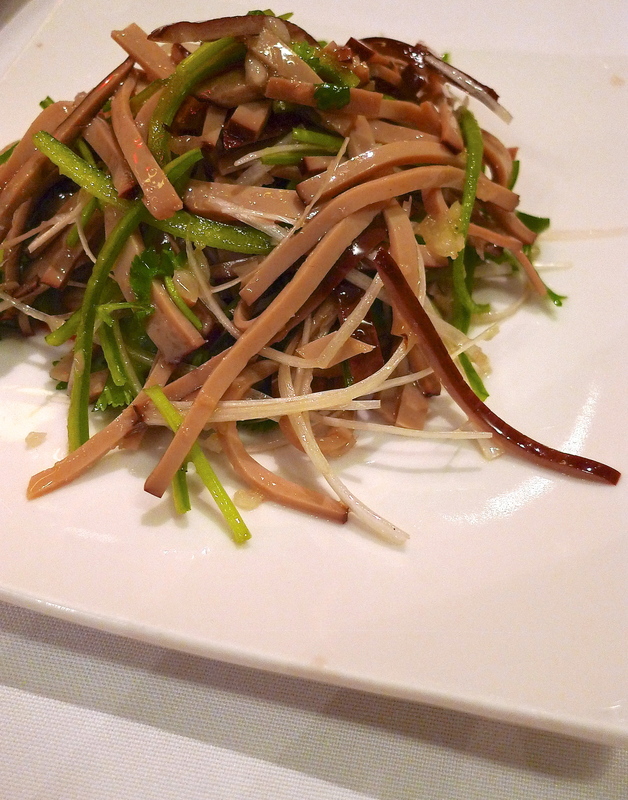 This dry bean curd salad is the perfect example and it was, definitely, a welcome addition to our meal. Tasty, but for me, it took a back seat to the bolder plates. Mandarin Fish Steamed in Light Soy Sauce. 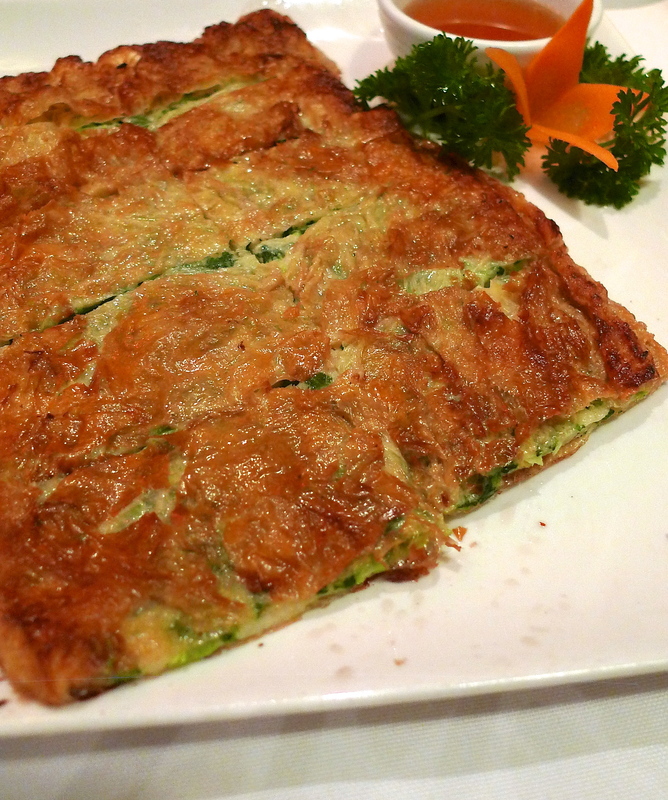 Tender, flaky and absolutely wonderful! The mushrooms and onions on the bottom also deserve a mention. Another non-spicy dish and pure pleasure. Sliced Beef in Spicy Sauce. Here, my friends, is the granddaddy spicy course of our meal! Slices of beef along with bean sprouts, scallions, cucumbers and more vegetables…but for the life of me I can not remember what. How can one even think beyond the spicy beef bathing in this sauce?? 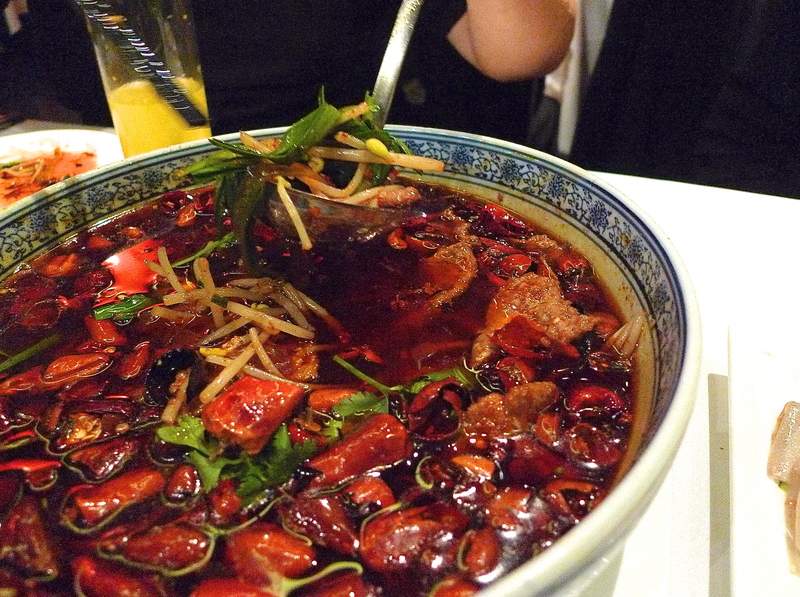 And, yes, those beautiful red bits floating around are all hot Sichuan peppers. Want to see it closer? 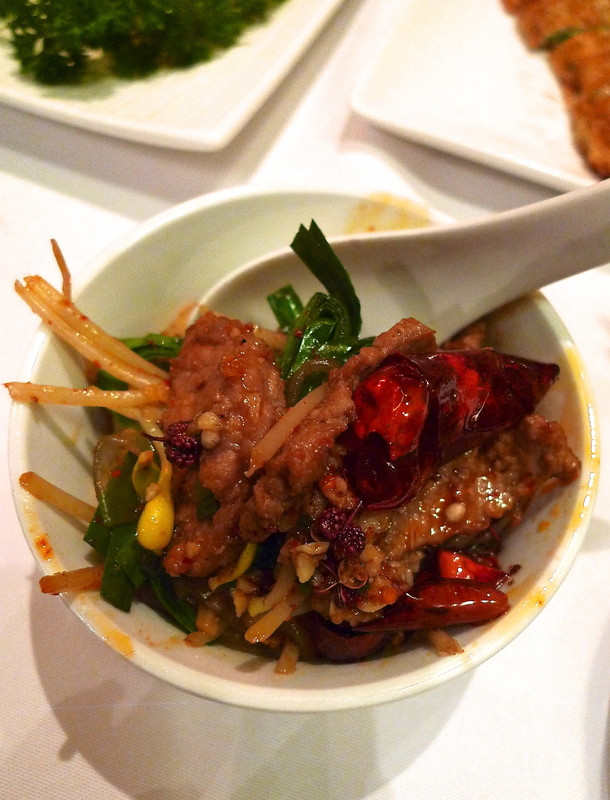 Take an intimate look at the spicy peppers intertwined with the red pepper corns and beef. I will not mince words with you. This is one spicy dish. So…unbelievably…good! 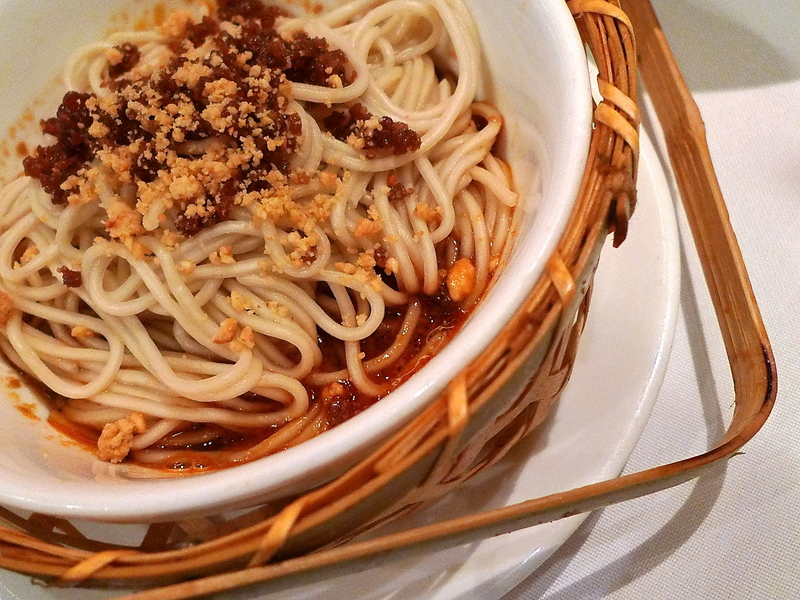 If you are a regular to my blog, you’re familiar with my weakness for all things noodle-related and this is one of my favorite ways to eat noodles, Chinese style. You mix up the spicy sesame/peanutty sauce with the minced pork and noodles and try not to embarrass yourself as you’re inhaling the noodles faster than you can handle your chopsticks. 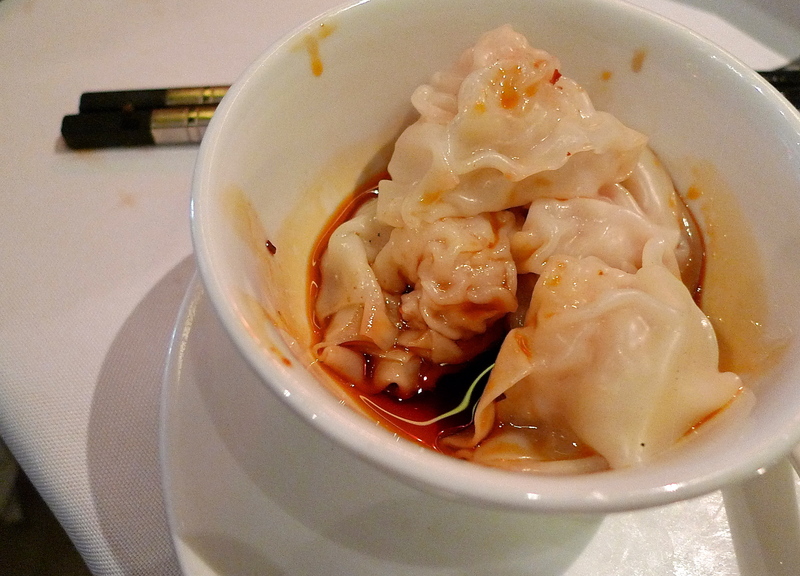 These wontons are exquisite – perfectly delicate, translucent skin covering a succulent minced shrimp/pork filling….and you got it, more hot chili oil. In addition to having a happy, stupid grin on my face, my numb mouth at this point raised the white flag. I can not state how much this drink hit the spot. I can take the heat, but this was the fire extinguisher-type beverage, sent from heaven to put out the 3-Alarm fire happening in my mouth. 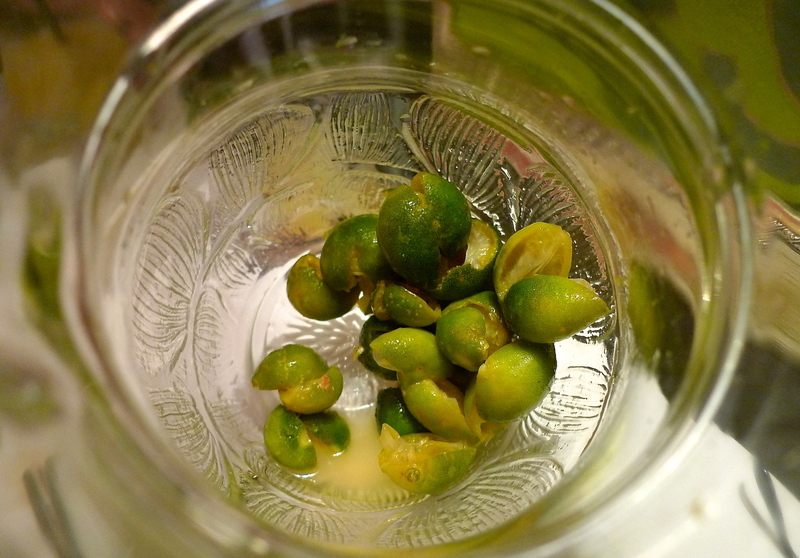 Besides being a refreshing drink, the little limes are utterly adorable, aren’t they? Talk about starting a trip with a BANG. It is going to be a week of culinary treats and, thankfully, I am up for the task!